The Columns of the Giants is a very interesting geologic site located along the Middle Fork of the Stanislaus River canyon on Highway 108. There is an easy one-quarter mile walk from Pigeon Flat Picnic Area that takes you to the base of the columns. 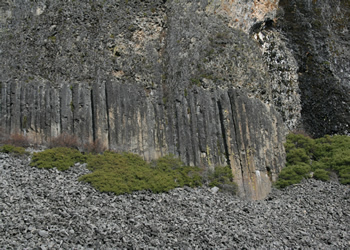 The Columns were formed by lava from a couple of volcanoes well over 100,000 years ago. At a later time, a glacier cut through the area and exposed the columns. More photos. In 2007, five new signs were constructed along the path describing the geology of the Columns. Kudos to the Forest Service for helping us to understand how these magnificent columns were formed. Directions: From the Summit Ranger Station located on Highway 108 and the Pinecrest Lake Road exit to Pinecrest, continue east on 108 for just about 25 miles. You will see a sign for the Column of the Giants Geologic Site and the Pigeon Flat Picnic Area on the right side of the highway. There is a good-sized parking area and from there you cross a foot bridge and continue on the marked trail. This particular trail is easy access for anyone in a wheelchair. It is less than a one-mile walk.